There are days in your life you look forward too and others you’d rather avoid. Today is one of the latter. Events and anniversaries have an effect, especially if they’re ones you’re trying your hardest to avoid. Today is the 2nd Mother’s Day without mum and I’m sure each one will become a little easier, but 14 years after Dad passed I’m also sure that on Father’s Day, I’ll still wish I could buy him a cheesy card and receive one of his best bear hugs ever! There are lots of things we can do to distract ourselves from grief and so-called coping strategies, but today’s not one of those as there’s a story I need to get off my chest and one I hope might bring a shred of comfort to others missing their mums, or even a wry smile! Last October 17th (yes it’s taken me a while ) was another anniversary. They always say the “Firsts” are the most difficult and it would have been Mum’s Birthday. I forgot her birthday once as a child and still remember the heartache and tears – until Dad put the situation right with her favourite Milk Tray chocolates and daffodils. I never forgot it again! For some reason that day, I’d agreed to deliver one of a series of lectures at Cardiff Metropolitan University. The preparation kept me distracted and I’d pre-decided to not think about anything until I’d got home that evening or engage in any social media..probably in fear of the possibility of breaking down in tears. The day had something different in store. On waking and making my obligatory mug of tea, I sometimes put the radio on Chris Evans’ breakfast show. Its a cheery start to the day when you’re doing your damndest to be light and airy. For those who aren’t familiar with it, they have a”pause for thought” feature and this is delivered by a range of religious or spiritually-minded people. The morning’s talk was given by Julia Neuberger, that’s unusual I thought, I have one of her books in my bookcase and have always found her really inspiring. If I could have picked someone to talk to me this morning it might have been her. Off we go, Let’s get inspired! She began talking about a Jewish festival of “death” and she delivered a message about endings and new beginnings or renewals and how this event is not morbid at all. That’s great I thought….how lovely we start the day with Death! Smiling ruefully, I notice the sun shining through the blinds, a lot like today, that particular way it has of shining…..as if it has a secret, an eerie calm as if something surprising’s going to happen. I just got on with my morning and by the time I got into the car, I was all clean and fed and ready for the hour’s drive to the University. The day’s lecture topic was “Pain” and yes I really felt the irony. In the car, I often listen to podcasts or audible books. The tone is often uplifting and as I needed that today I tapped on Oprah’s SuperSoul Conversations. They’re a mixture of interviews with celebrities, authors and new-age speakers talking about the big stuff in life and their personal journeys. I tapped on the “up next” button, started the car engine and off to go. Oprah’s introduction I now know very well “The greatest gift you can give yourself is Time “, so true, and today we’ll be talking to the parents of one of the children of Sandy Hook. Great I thought, just what I need, real cheerful stuff. Writing this just 5 months later I cannot believe there been another tragic USA school shooting. I could, of course, have just switched it off, but maybe its the stubborn part of me, I thought “No, I can do this, grief at breakfast, grief in the car -Bring it on!” The mother’s story was actually really incredible and inspiring. Her son’s name was Ben, also my Dad’s middle name – I used to call him a flowerpot man as his first was Bill…anyway, I digress. There are 2 parts of her story that stick in my mind, and I will listen to again. I’d recommend it to anyone experiencing grief, as she survives in hope despite those events being at their darkest, most cruel and horrific. The first part of the story relates to the morning of the shooting. That morning they were early for school as they’d dropped Ben’s brother off at breakfast club. A lady the mum met later in life, said she’d overheard the conversation she’d had with Ben there. The lady said she wasn’t in the habit of eavesdropping conversations but couldn’t help thinking how lovely it was. At one point the 6-year-old Ben asked – “Mum what does forgiveness mean?”. The second part is that she remembered sometime after Ben’s death, how he really liked lighthouses and how unusual that might be for a 6-year-old boy. 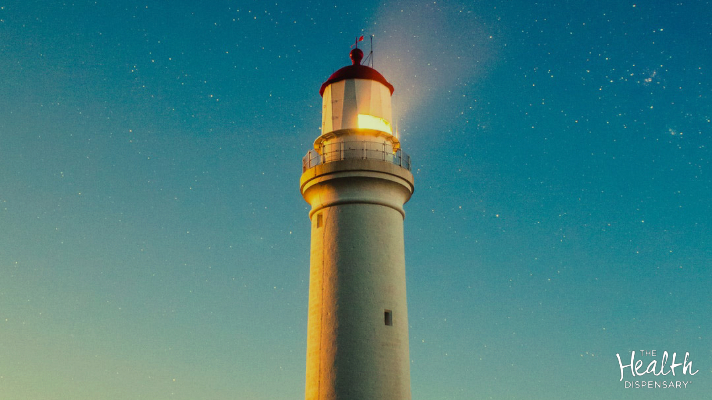 Now, whenever she sees a lighthouse, she remembers and thinks of that beacon of hope, a light that shines through darkness and helps others. By 2 pm, I arrive at the University, I deliver the lecture, I am still intact. Mission accomplished. I head home. The car ride home should be a doddle. I begin to smile ruefully, as the next podcast brings up a similar morbid topic- “what is going on?” Enough! There are too many coincidences for one day. I finally press the stop button on my iPhone and head for the inane safety of Radio 2. Except, its classical music, I check the station, yes it is BBC Radio 2. It goes on for a full track length, the most beautiful soaring uplifting sound – Mum always had Classic FM on the radio at home. It seemed she had now infiltrated the airwaves! I laughed at the absurdity of it all and said out loud,” ok Mum, I hear you- Happy Birthday!” I’ve never heard such a long piece of classical music played on Radio 2 at primetime ever before or since. When I got home I went for a lovely walk in nature with my partner and dog Delphi. When asked how my day was, I said it had been a little strange, although better than I thought, rather lovely, as I felt I had sort of spent it with my mum, despite my best efforts of avoidance. I said how touching the lighthouse story was in particular and how I liked that beacon of hope image. As we got home and started to make the house and ourselves comfy for the evening, I put the TV on. The BBC National news was on and the weather forecast about to start. “Let’s just watch this first” we agreed. Behind the male presenter was the loveliest, largest, most symbolic red and white-striped lighthouse you could ever wish for. We both smiled broadly, a slight shiver down the spine. “Even the clouds are fluffy” I Iaughed – “they even look like Mum’s hair”, I said joining in with the ridiculousness of it all. 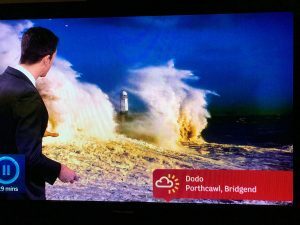 The lighthouse photograph had been sent in by a BBC viewer, a so-called “Weather-watcher” and their name is usually placed as a credit at the bottom of the screen. Some are sensible names, some are nicknames or Twitter handles etc. The name on the screen was “Dodo”. Underneath was the location of the photograph- Porthcawl. the place which was to be mum’s last holiday.